Those who are really in earnest must be willing to be anything or nothing in the world's estimation. I want you to understand that I never could have done the work I have if I had not had this woman at my right hand. The older I get, the greater power I seem to have to help the world. I distrust those people who know so well what God wants them to do to their fellows, because it always coincides with their own desires. The true woman will not be exponent of another, or allow another to be such for her. She will be her own individual self, — do her own individual work — stand or fall by her own individual wisdom and strength stand or fall by her own individual wisdom and strengh... She will proclaim the "glad tidings of good news" to all women, that woman equally with man was made for her own individual happiness, to develop every power of her three fold-nature, to use, worthily every talent given to her by God, in the great work of life. I shall work for the Republican party and call on all women to join me, precisely... for what that party has done and promises to do for women, nothing more, nothing less. Here, in the first paragraph of the Declaration [of Independence], is the assertion of the natural right of all to the ballot; for how can "the consent of the governed" be given, if the right to vote be denied? 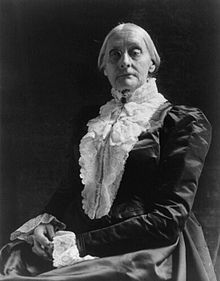 We no longer petition legislature or Congress to give of the right to vote, but appeal to women everywhere to exercise their too long neglected "citizen's right" … We assert the province of government to be to secure the people in the enjoyment of their unalienable rights. We throw to the winds the old dogma that governments can give rights. The Declaration of Independence, the United States Constitution the constitutions of the several states … propose to protect the people in the exercise of their God-given rights. Not one of them pretends to bestow rights. … One half of the people of this Nation today are utterly powerless to blot from the statute books an unjust law, or to write a new and just one. 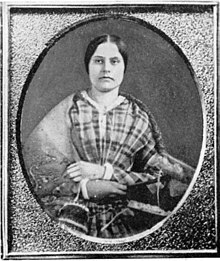 The women, dissatisfied as they are with this form of government, that enforces taxation without representation — that compels them to obey laws to which they have never given their consent — that imprisons and hangs them without a trial by a jury of their peers — that robs them, in marriage of the custody of their own persons, wages, and children—are this half of the people left wholly at the mercy of the other half. The older I get, the greater power I seem to have to help the world; I am like a snowball — the further I am rolled the more I gain. The one distinct feature of our Association has been the right of the individual opinion for every member. We have been beset at every step with the cry that somebody was injuring the cause by the expression of some sentiments that differed with those held by the majority of mankind. The religious persecution of the ages has been done under what was claimed to be the command of God. I distrust those people who know so well what God wants them to do to their fellows, because it always coincides with their own desires. On bicycling: "I think it has done more to emancipate women than anything else in the world. I stand and rejoice every time I see a woman ride by on a wheel. It gives woman a feeling of freedom and self-reliance. It makes her feel as if she were independent. The moment she takes her seat, she knows she can't get into harm unless she gets off her bicycle, and away she goes, the picture of free, untrammelled womanhood." On teaching: "In those days, we did not know any other way to control children. We believed in the goodness of not sparing the rod. As I got older, I abolished whipping. If I couldn't manage a child, I thought it my ignorance, my lack of ability, as a teacher. I always felt less the woman when I struck a blow." "I must have an audience to inspire me ... to save my life, I couldn't write a speech". "It all rose out of the men refusing to let me speak" at a temperance meeting. "Women were the bond slaves of men". "I know God never made a woman to be bossed by a man". "The law says that only idiots, lunatics and criminals shall be denied the right to vote. So you see with whom all women are classed." "When two people take each other on terms of perfect equality, without the desire of one to control the other to make the other subservient, it is a beautiful thing. It is the truest and highest state of life." "I never felt I could give up my life of freedom to become a man's housekeeper and drudge. ... Once men were afraid of women with ideas and a desire to vote. Today, our best suffragists are sought in marriage by the best class of men." Interview with Nellie Bly, New York World, 2 February 1896, p. 10. My every right, constitutional, civil, political and judicial has been tramped upon. But, yesterday, the same man-made forms of law, declared it a crime punishable with $1,000 fine and six months' imprisonment, for you, or me, or any of us, to give a cup of cold water, a crust of bread, or a night's shelter to a panting fugitive as he was tracking his way to Canada. And every man or woman in whose veins coursed a drop of human sympathy violated that wicked law, reckless of consequences, and was justified in so doing. May it please your honor, I shall never pay a dollar of your unjust penalty. All the stock in trade I possess is a $10,000 debt, incurred by publishing my paper — The Revolution — four years ago, the sole object of which was to educate all women to do precisely as I have done, rebel against your man-made, unjust, unconstitutional forms of law, that tax, fine, imprison and hang women, while they deny them the right of representation in the government; and I shall work on with might and main to pay every dollar of that honest debt, but not a penny shall go to this unjust claim. And I shall earnestly and persistently continue to urge all women to the practical recognition of the old revolutionary maxim, that "Resistance to tyranny is obedience to God." 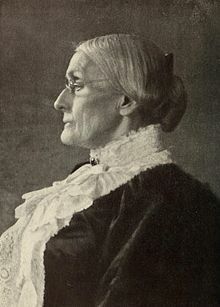 On her $100 fine, as quoted in An Account of the Proceedings on the Trial of Susan B. Anthony on the Charge of Illegal Voting] (1874) The "old revolutionary maxim" Anthony uses here has been variously attributed to William Tyndale, Benjamin Franklin, and Thomas Jefferson, as well as to herself. Variant: Resistance to tyranny is obedience to God; I shall never pay a penny of this unjust claim. Unsourced variants: Resistance to tyranny is obedience to God, and I shall never pay a penny of this unjust claim. Resistance to tyranny is obedience to God, and I shall never pay a penny of this unjust fine. No matter what the motive, love of ease, or a desire to save from suffering the unborn innocent, the woman is awfully guilty who commits the deed. It will burden her conscience in life, it will burden her soul in death, but oh, thrice guilty is he who, for selfish gratification, heedless of her prayers, indifferent to her fate, drove her to the desperation that impelled her to the crime! Anonymous essay signed "A" in The Revolution, August 8, 1869. Often attributed to Susan B. Anthony, who was the owner of the newspaper. Ann Dexter Gordon, PhD, leader of a research project at Rutgers University which has examined 14,000 documents related to Anthony and Stanton, writes that "no data exists that Anthony ... ever used that shorthand for herself", and that the essay presents material which clashes with Anthony's "known beliefs".